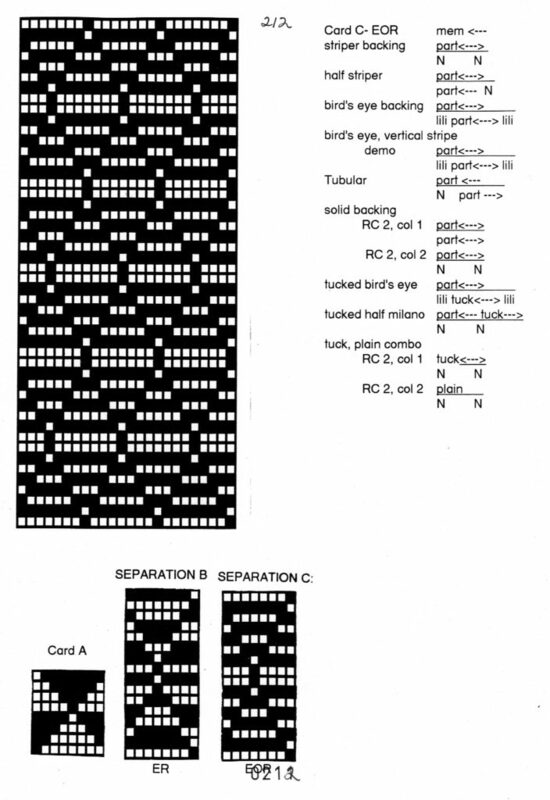 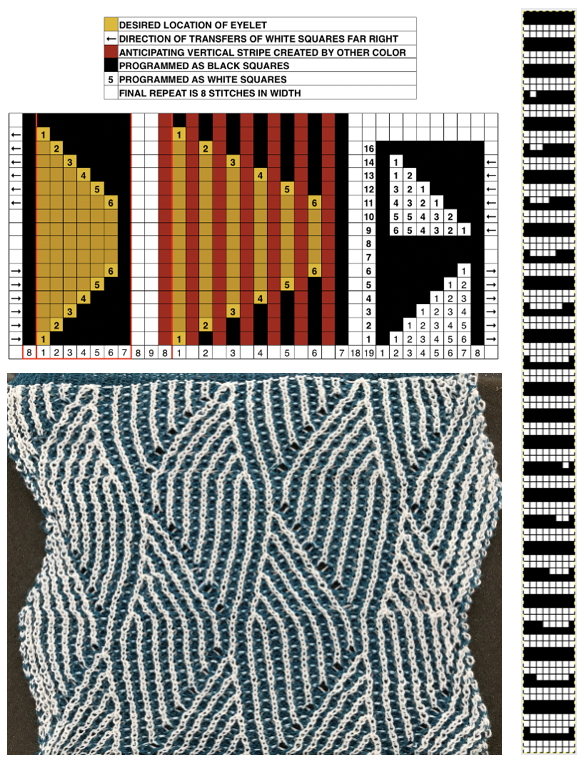 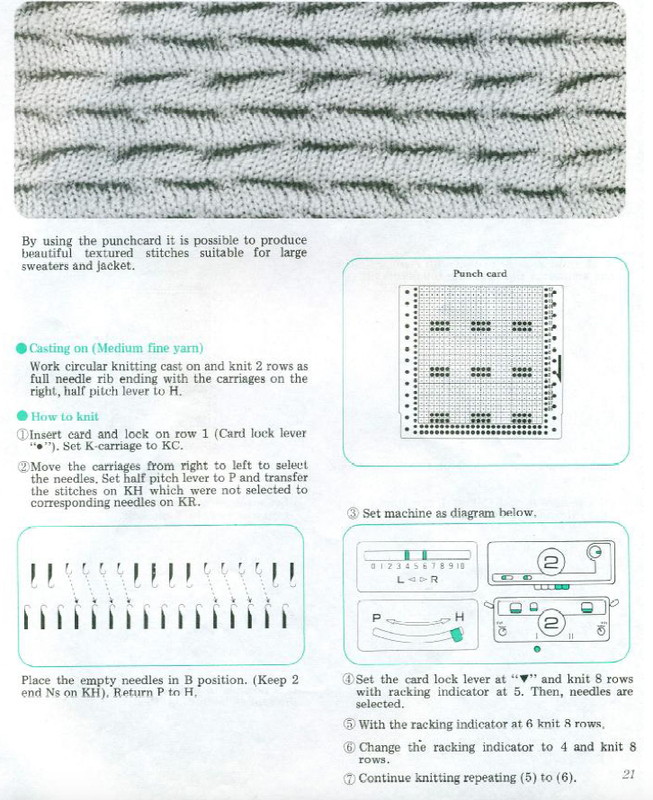 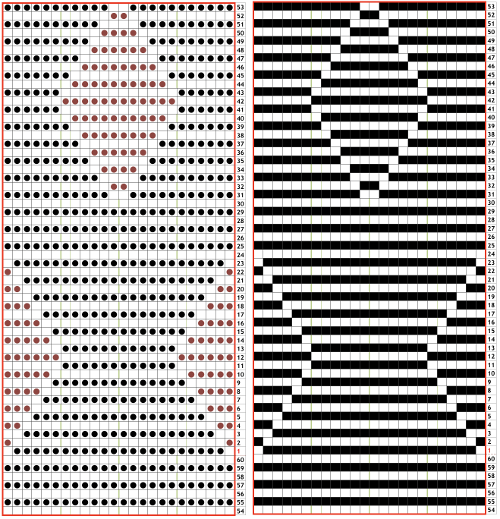 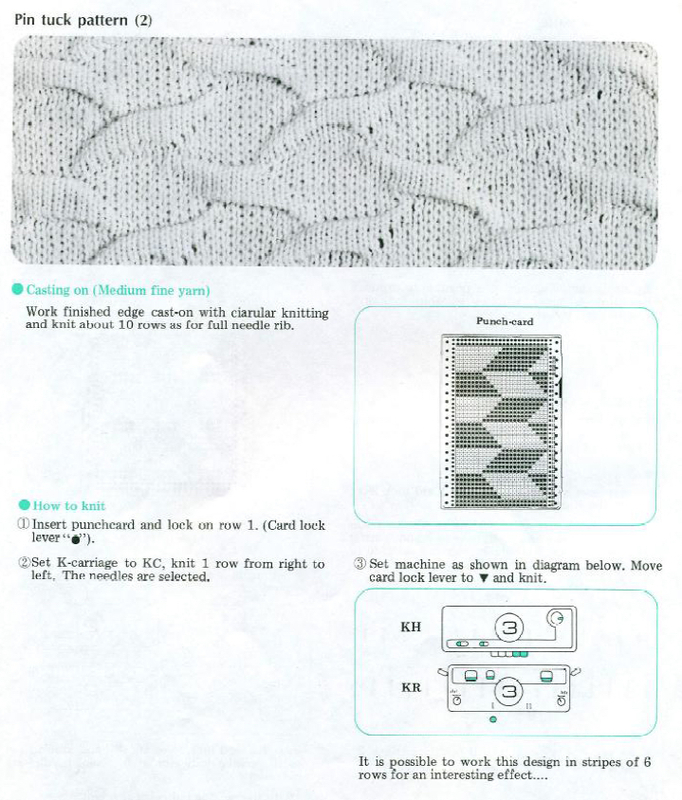 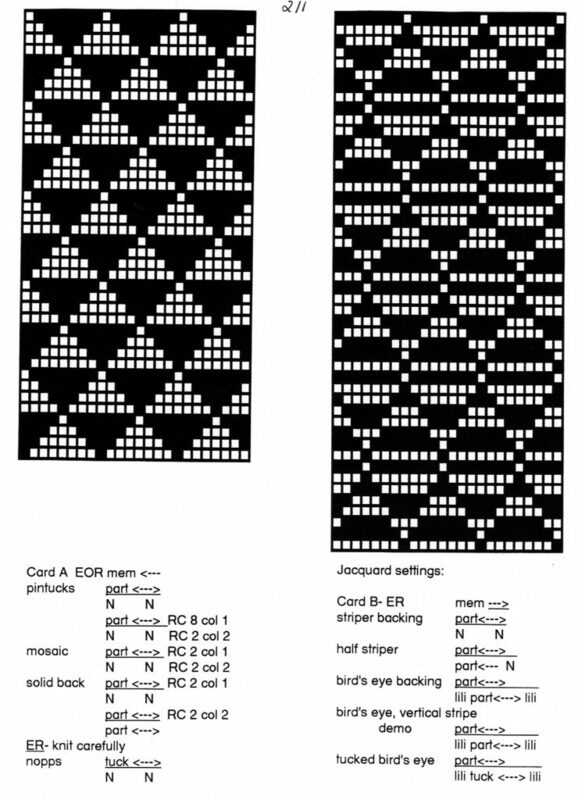 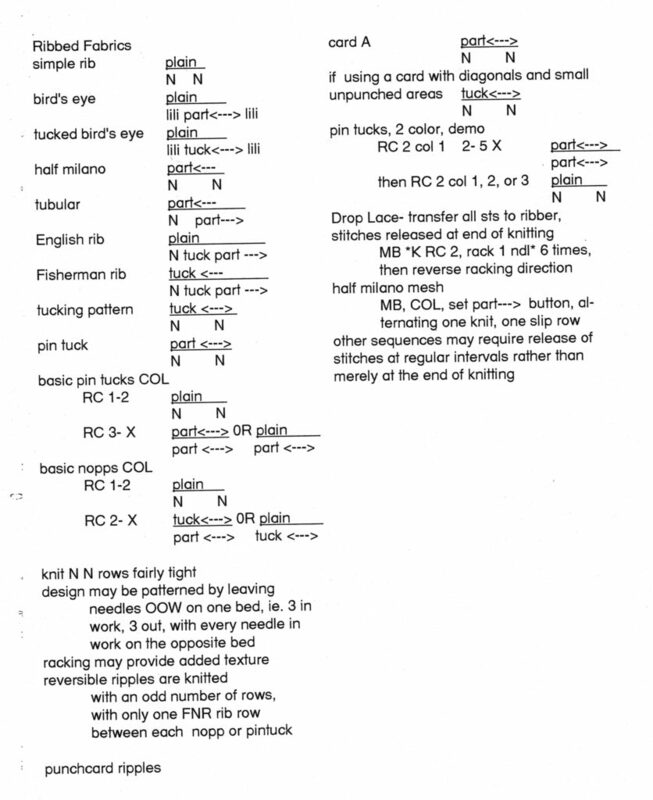 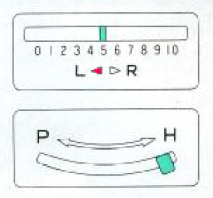 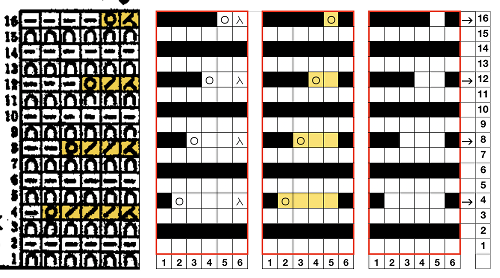 The Brother Knitting Techniques book has series of illustrations on how to manage a mock rib in various configurations on pages 7-15. 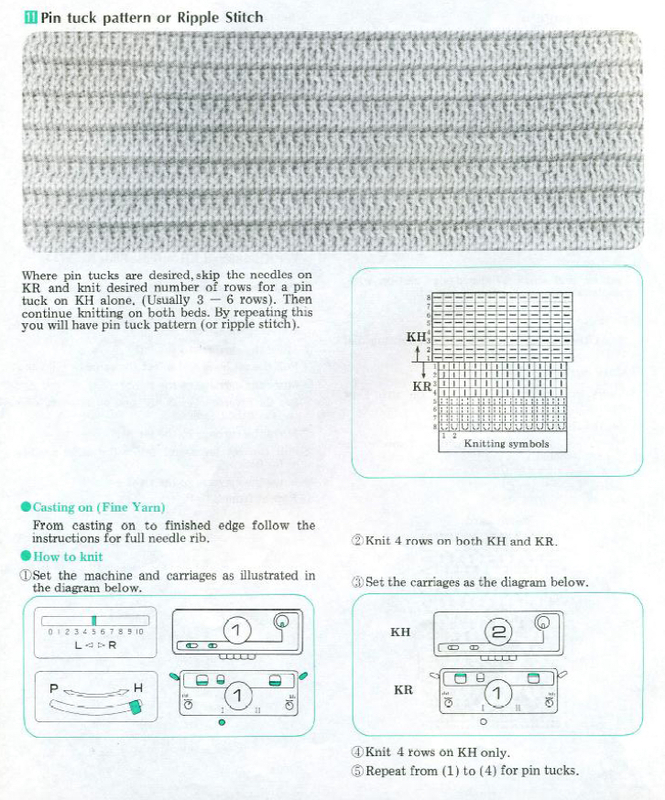 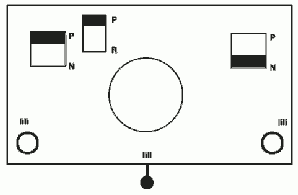 The manual is now available for free download online, and is an excellent reference. 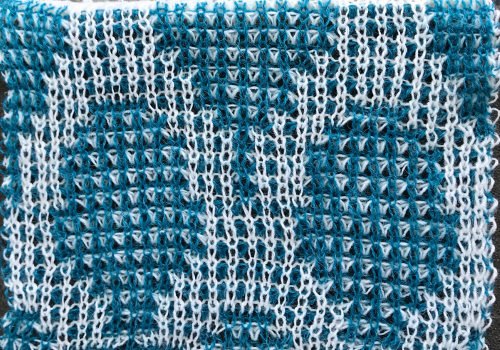 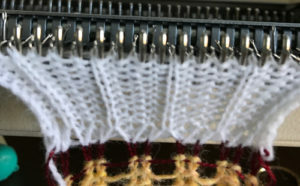 This technique requires waste yarn start, followed by a row of ravel cord. 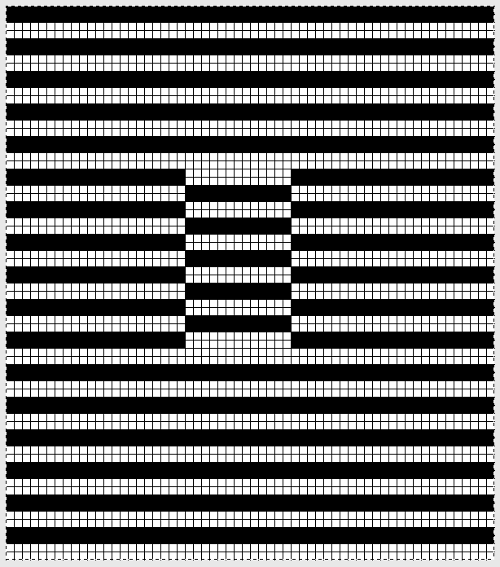 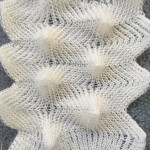 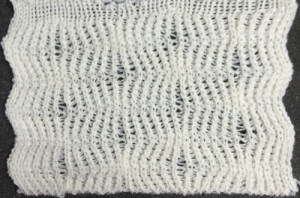 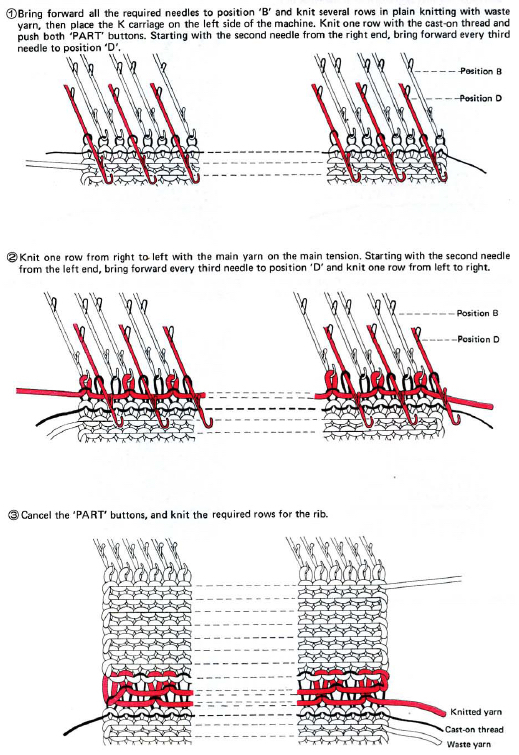 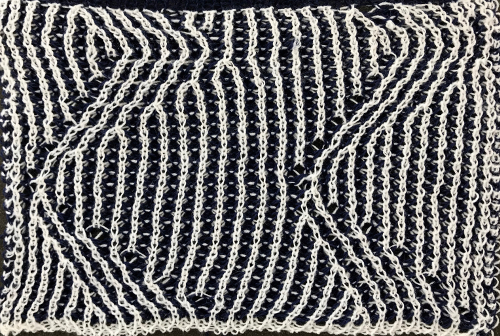 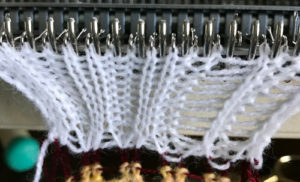 The resulting knit creates ladders or stitches that will in turn be dropped, then latched up and reformed into knit stitches on the purl ground. 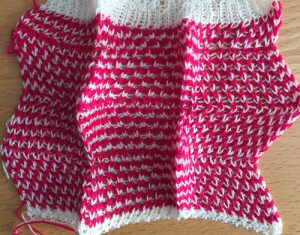 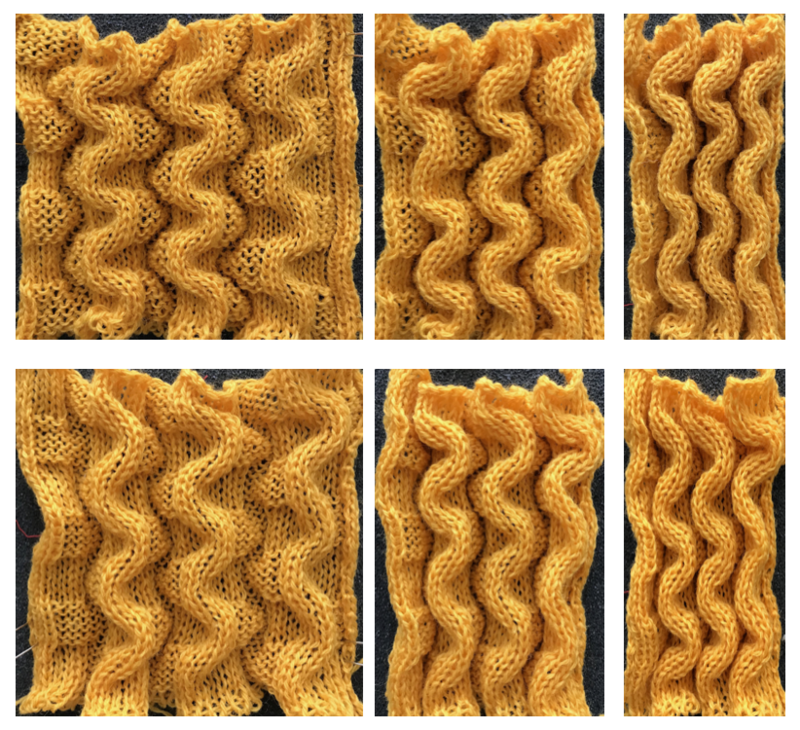 Reducing the knit tension by as much as 2-3 numbers is recommended after the ravel cord row. 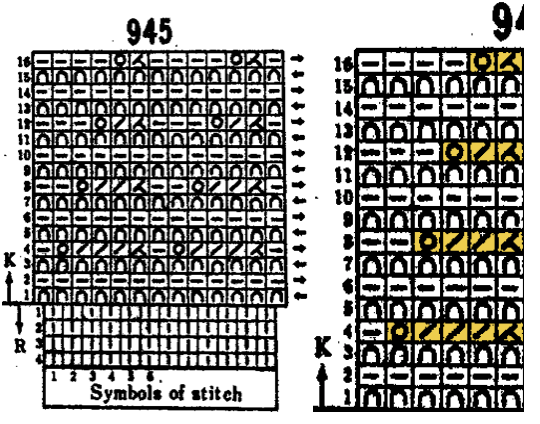 The needles marked in blue and green in the first image below are needles that are pulled back to A position prior to starting the piece. 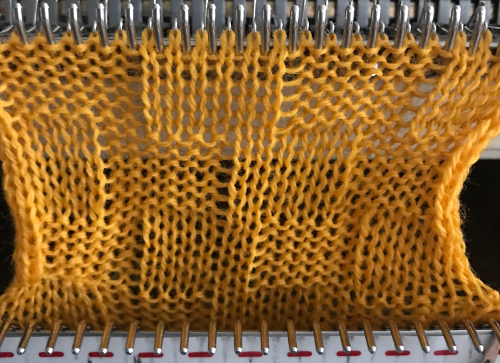 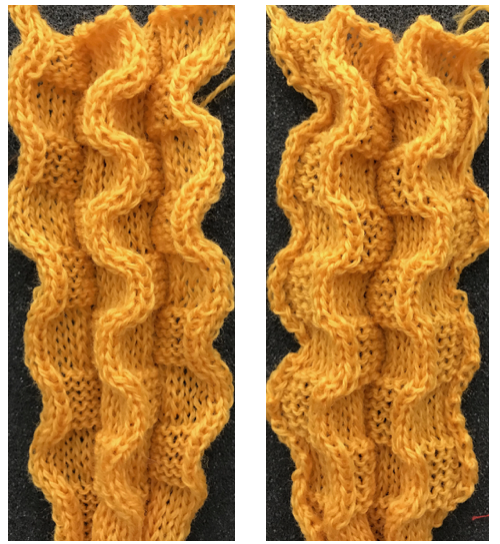 After the waste yarn and ravel cord (hatched yellow) start, three rows are knit with the garment yarn. 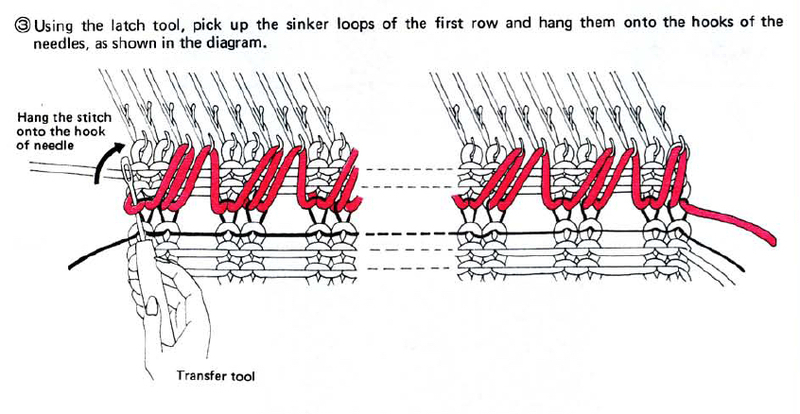 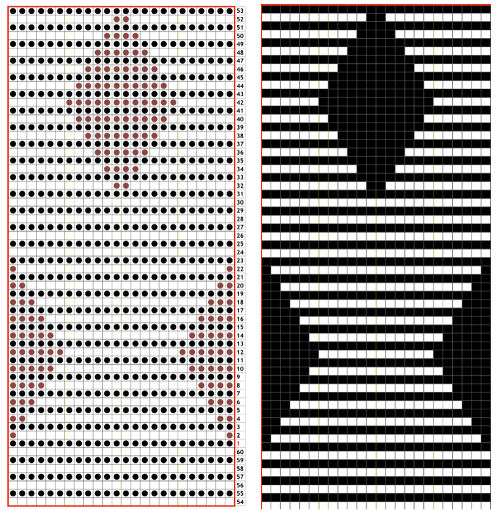 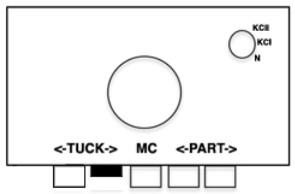 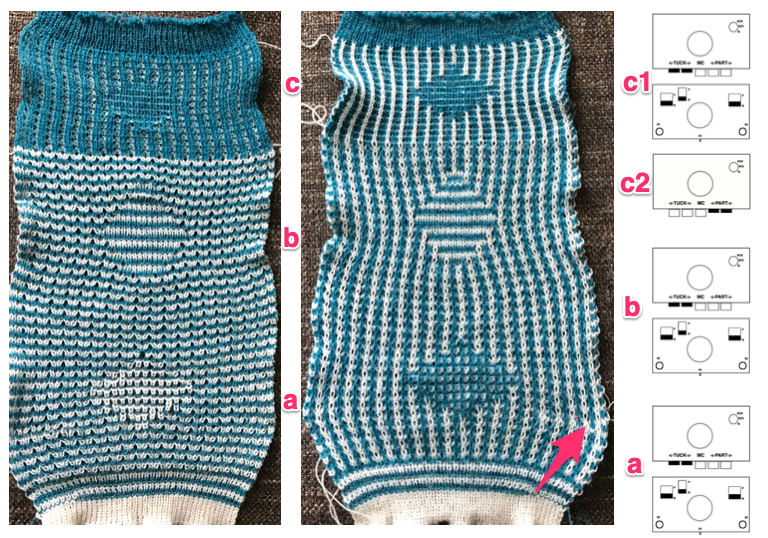 Using a transfer tool, pick up the sinker loops from the first row knit (orange), and hang them on the corresponding needles on the diagram (follow red arrows). 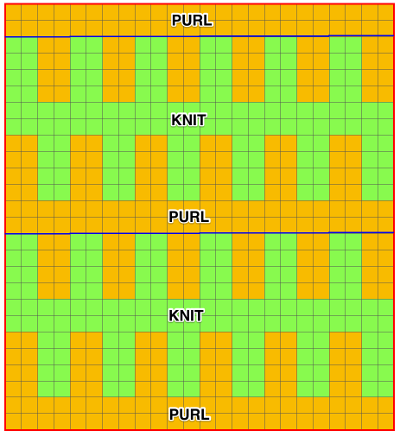 One may at this point continue with needles (green) left out of work, or return the needles (blue) to work position. 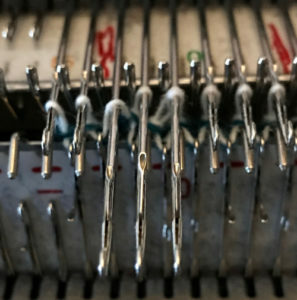 If needles are left OOW, ladders will continue to be created. 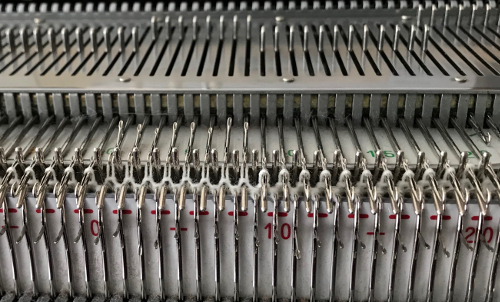 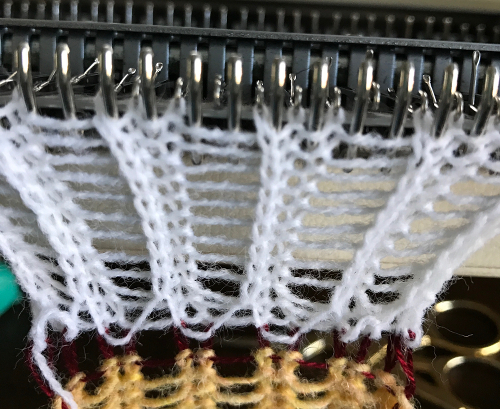 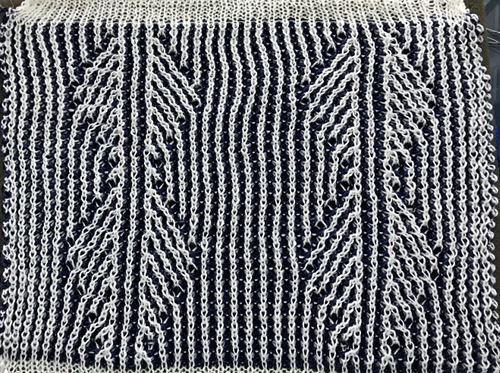 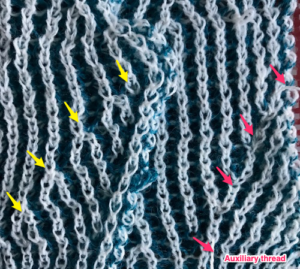 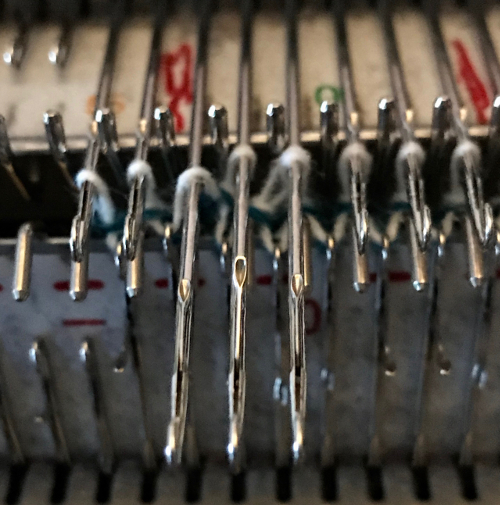 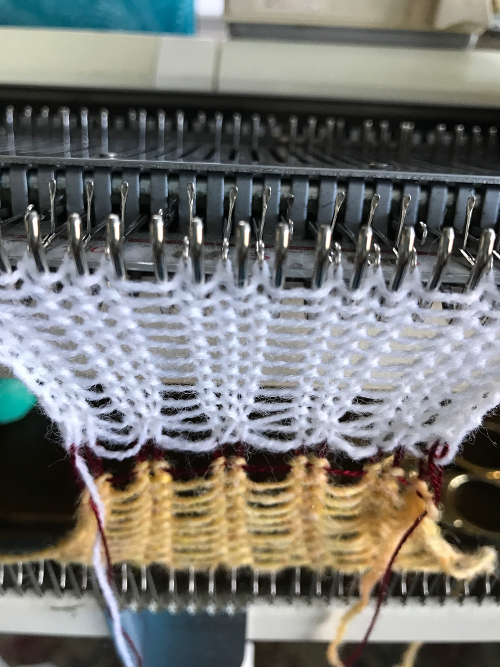 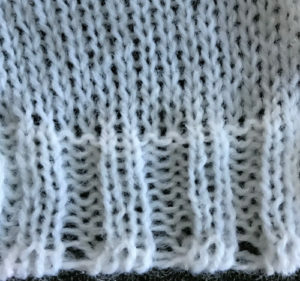 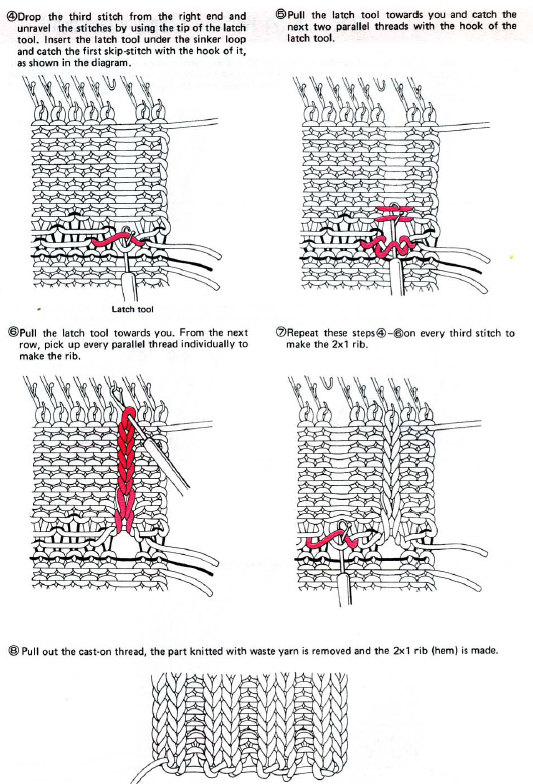 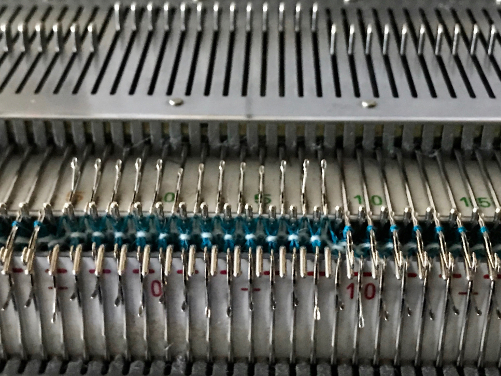 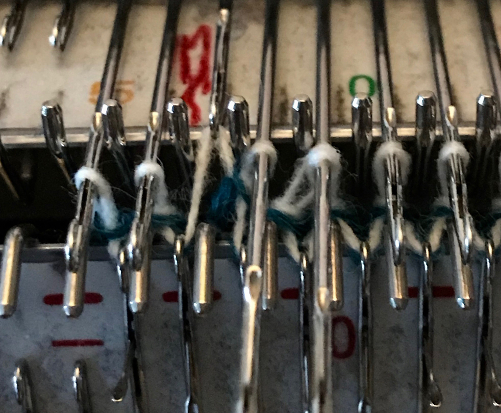 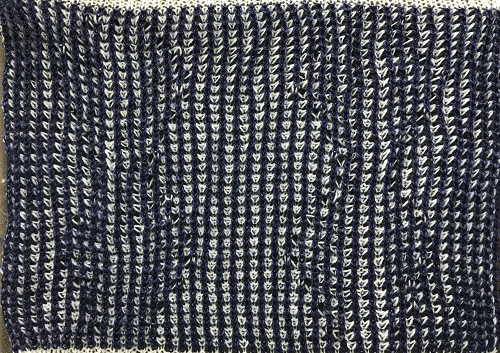 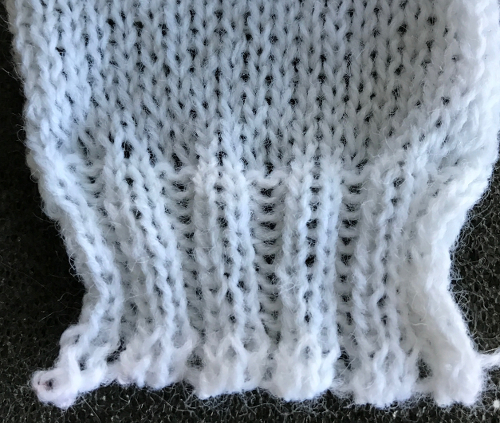 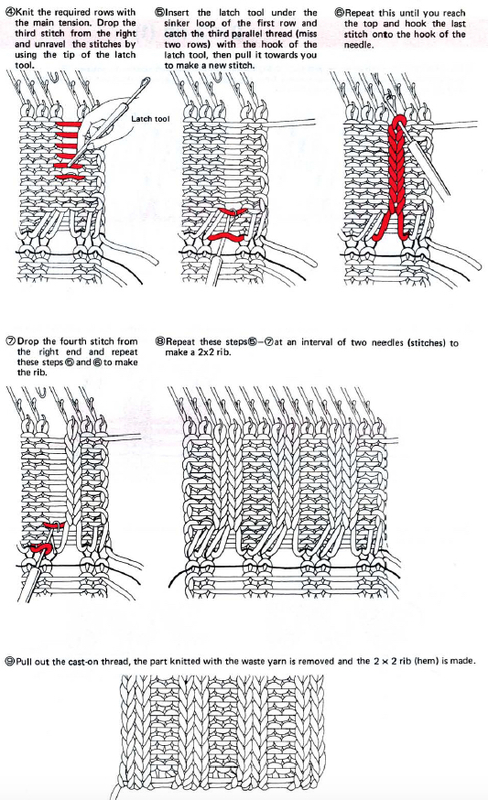 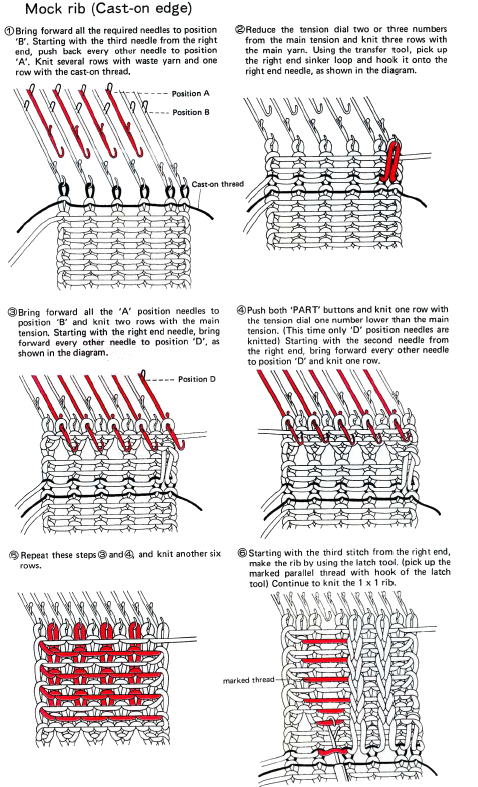 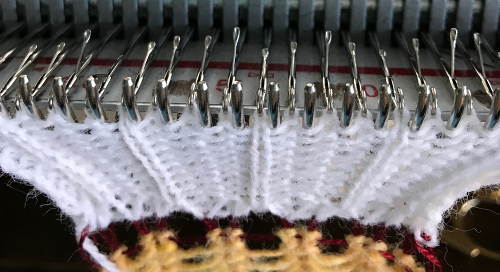 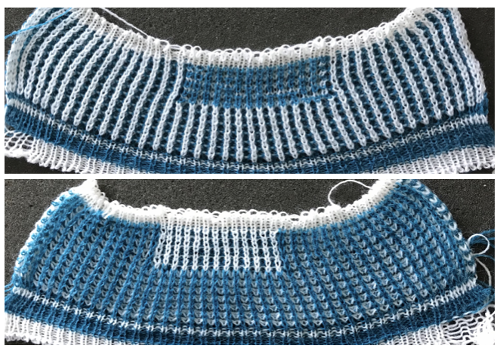 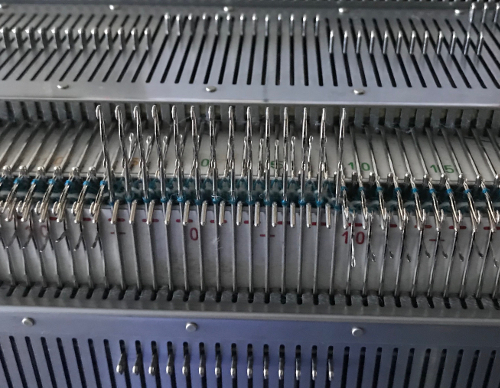 If they are returned to work, a loop is created on the empty needle on the first knit pass, formed into a stitch on the second pass, resulting in an eyelet. 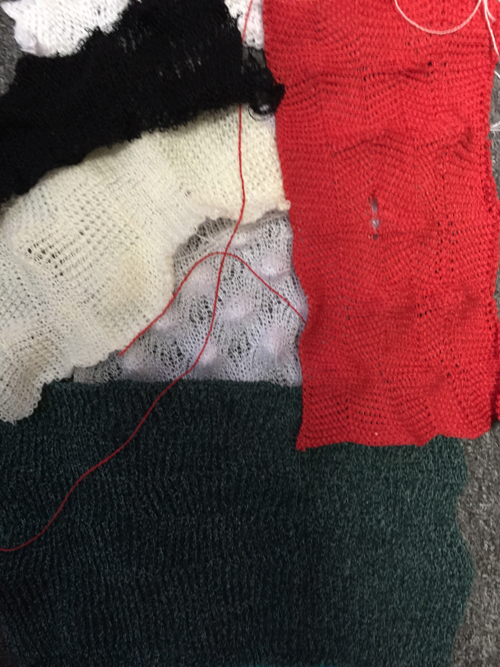 Every needle treated in this manner will now be knitting. 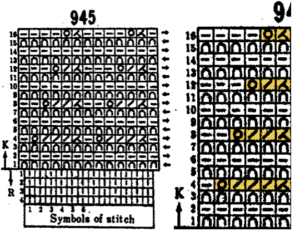 If stitches rather than ladders are formed for the height of the rib, then those stitches (blue) will need to be dropped, and in turn latched up. 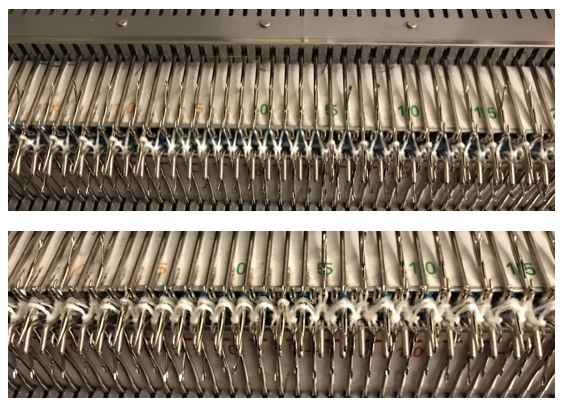 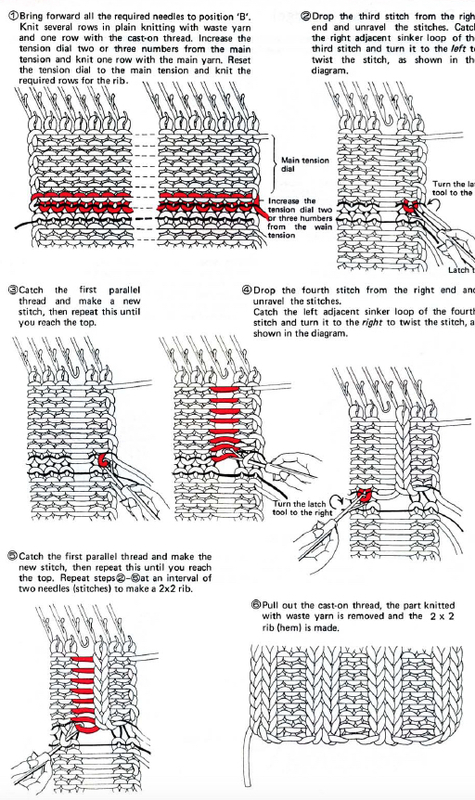 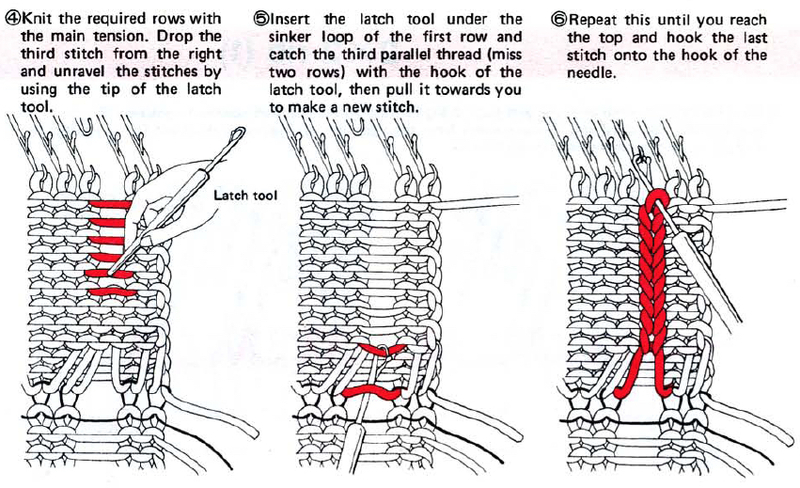 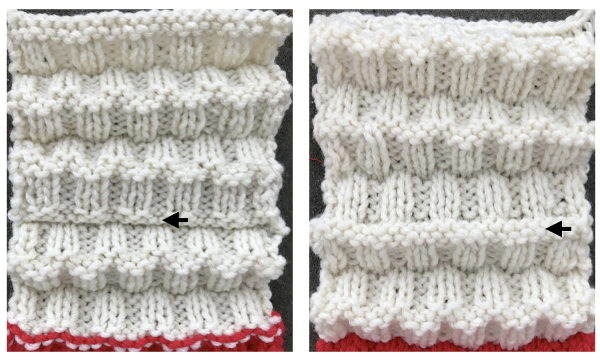 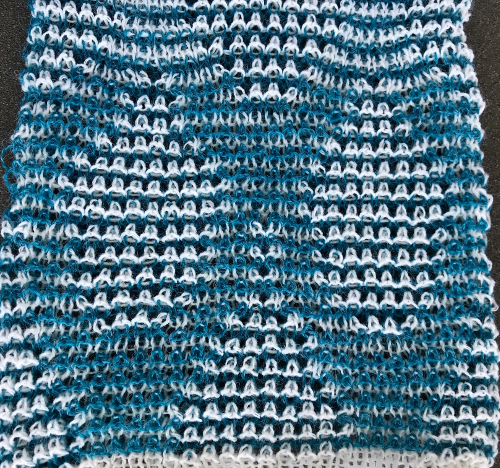 In both instances the latch tool goes under the first ladder created, 2 rows are skipped, the latch tool then catches the third parallel row, and pulls it through the first to make the required knit stitch. 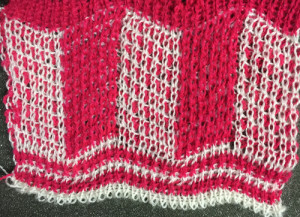 The process continues up the height of the “rib”. 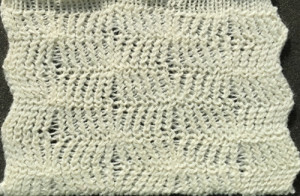 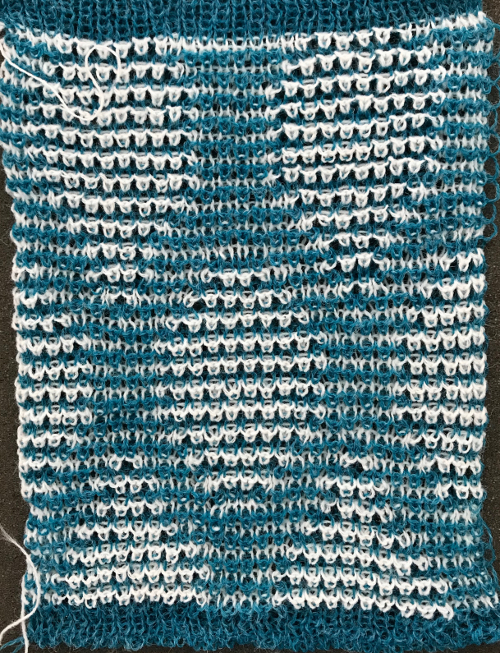 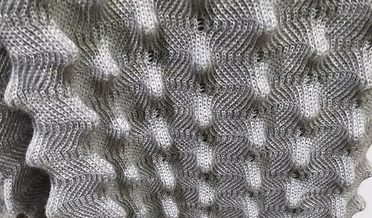 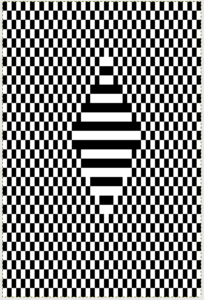 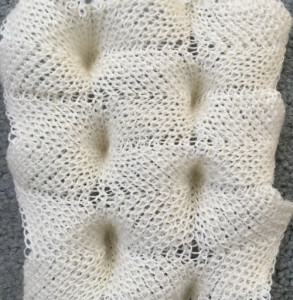 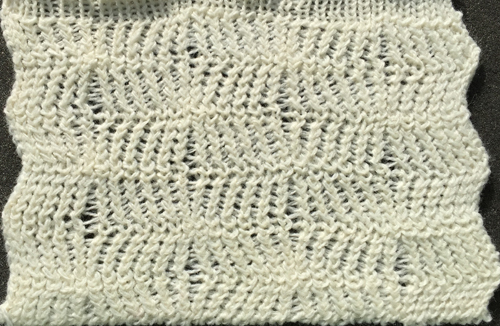 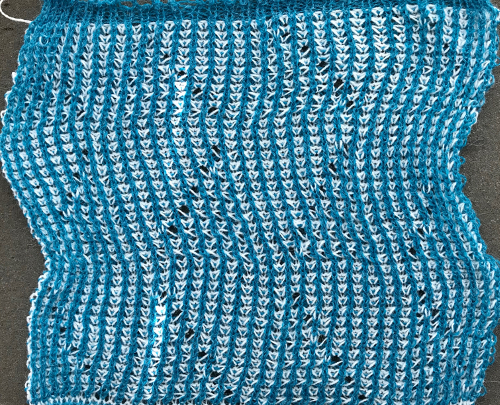 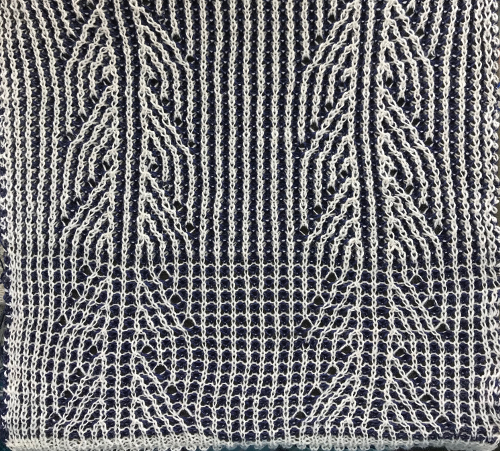 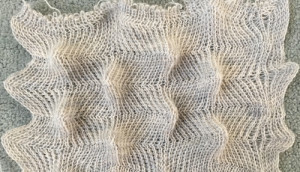 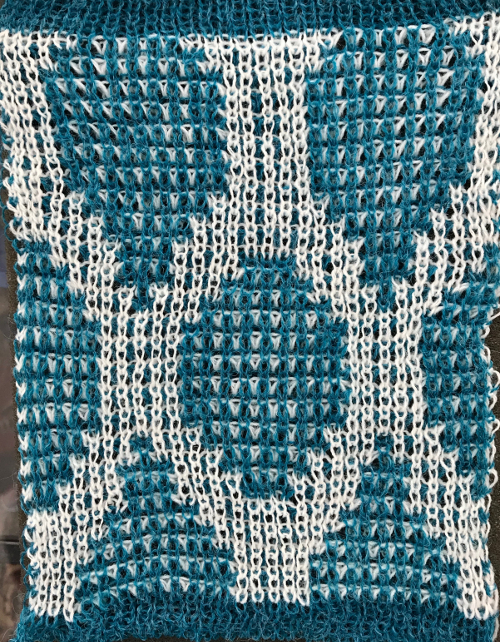 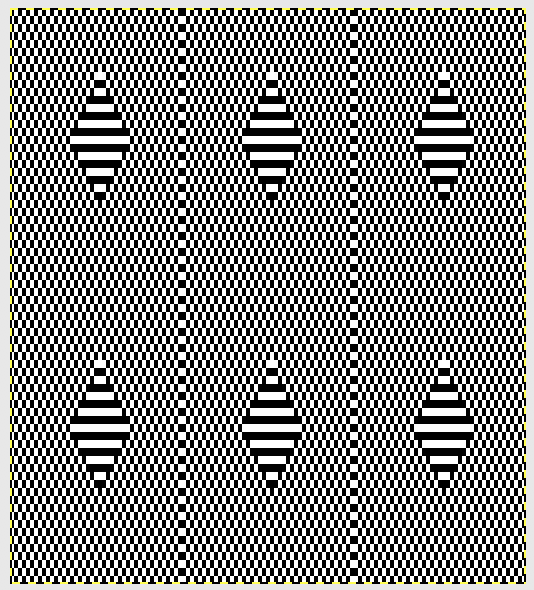 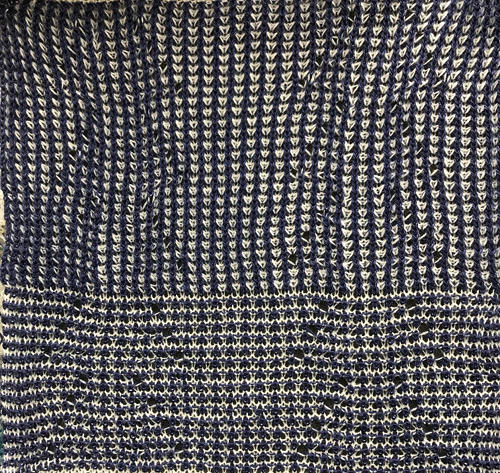 In this illustration the main yarn begins to knit with COL.
My sample was knit in a 2/15 acrylic, a bit thin for this technique, and if pressed, the fabric would be flattened permanently. If the intent is to have the rib retain it “spring and stretch” it is best to use a yarn with memory, such as wool. 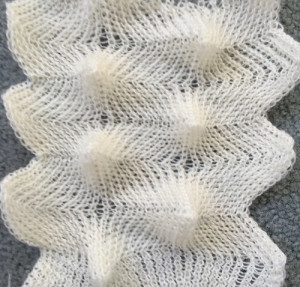 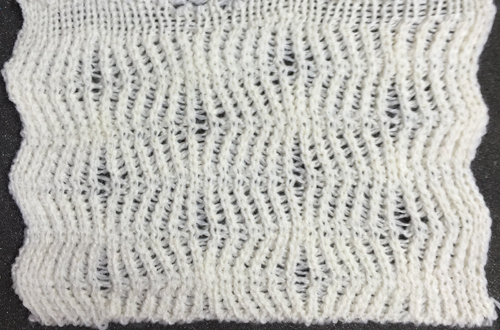 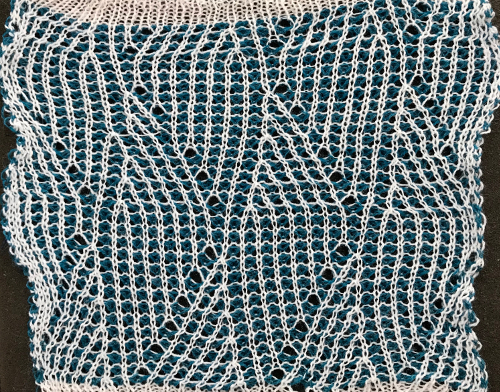 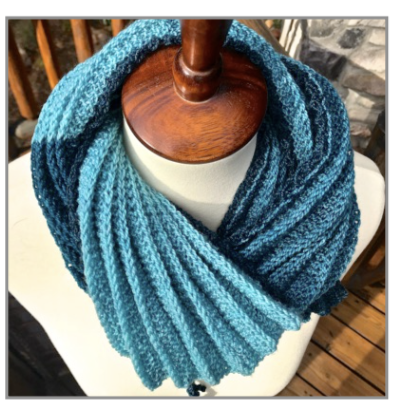 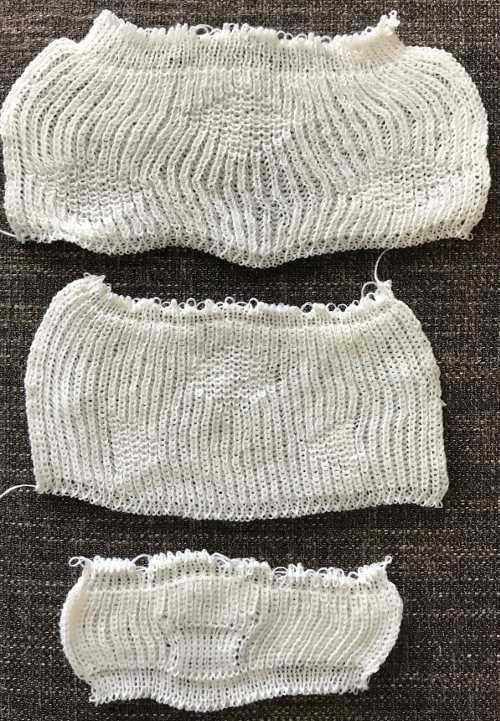 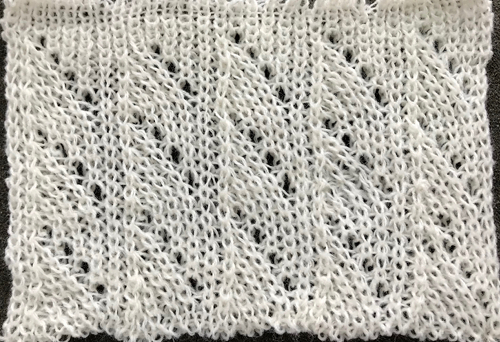 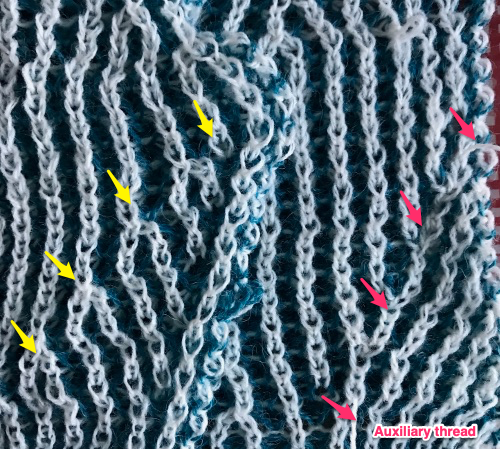 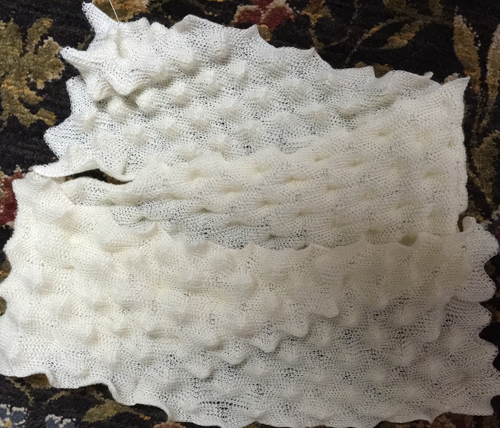 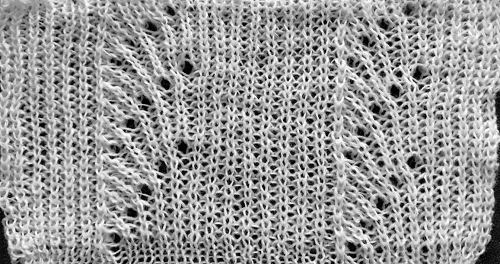 If a slip stitches or FI are to be used for the body of the knit, they will create a much denser fabric. 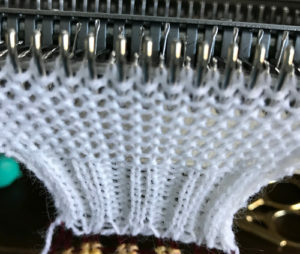 The yarn in the rib may in turn need to be doubled to produce enough substance. 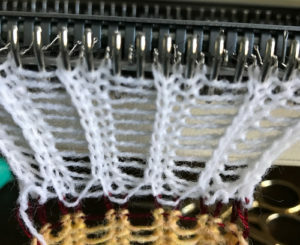 As always swatching is recommended before committing to a large piece in any technique. 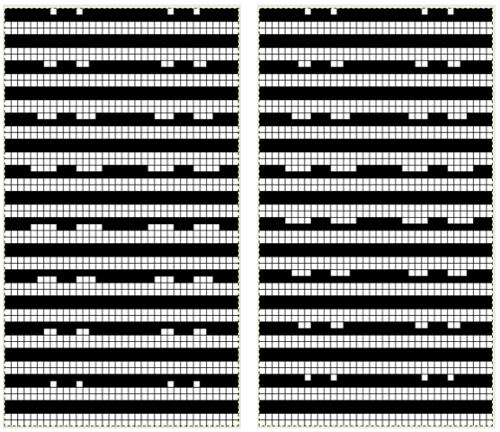 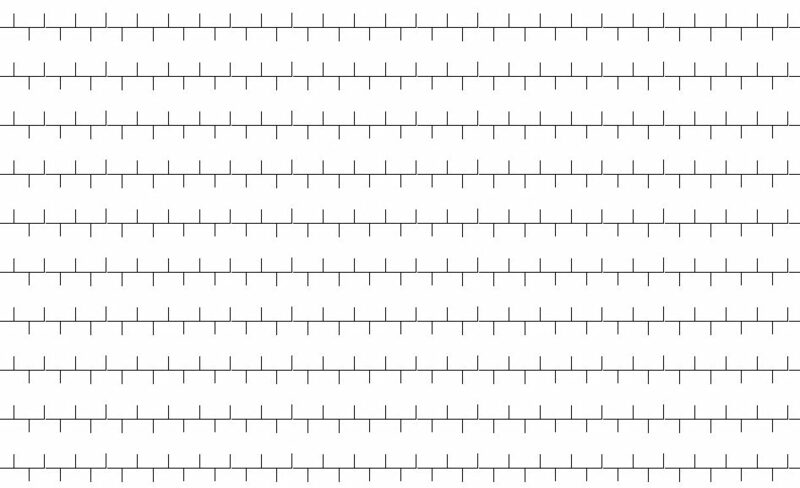 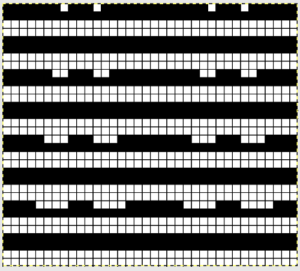 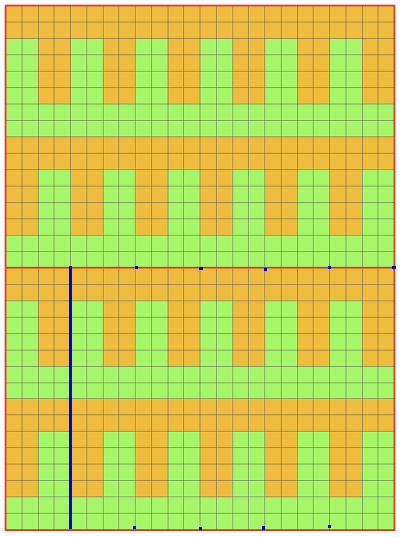 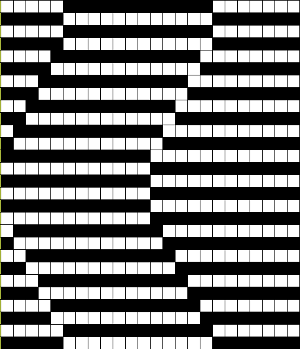 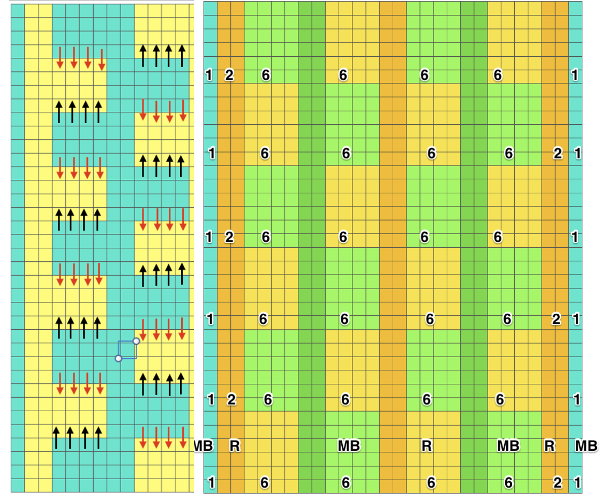 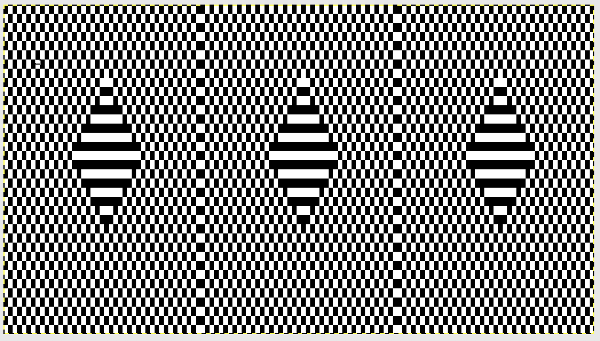 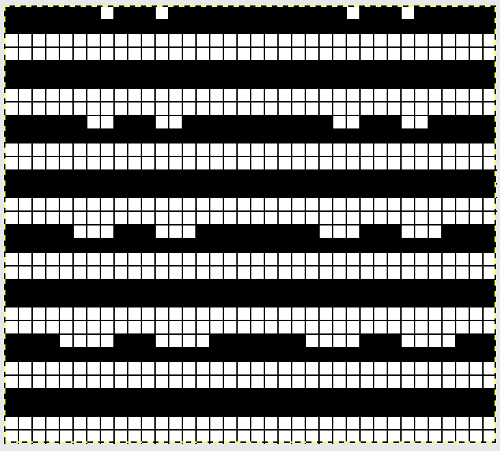 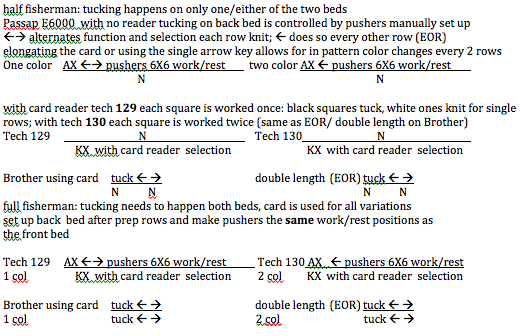 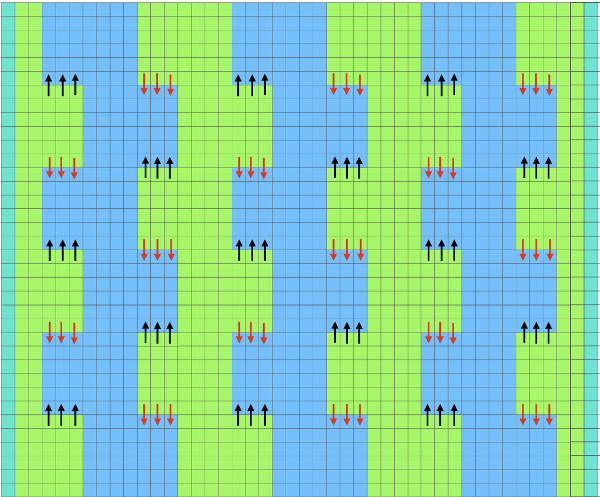 Depending on the sort of rib, the beds need to be aligned in most instances so that the needles on opposing beds line up between each other. 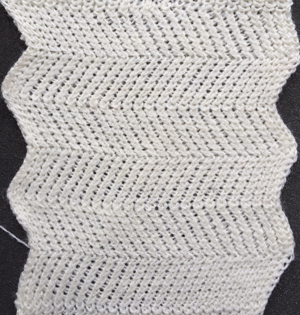 For this ribber cast on, the beds start at full pitch, for EON knitting. 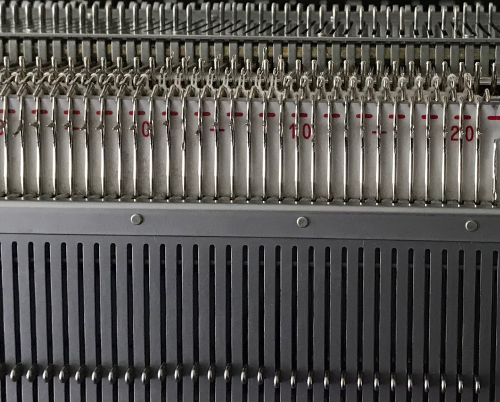 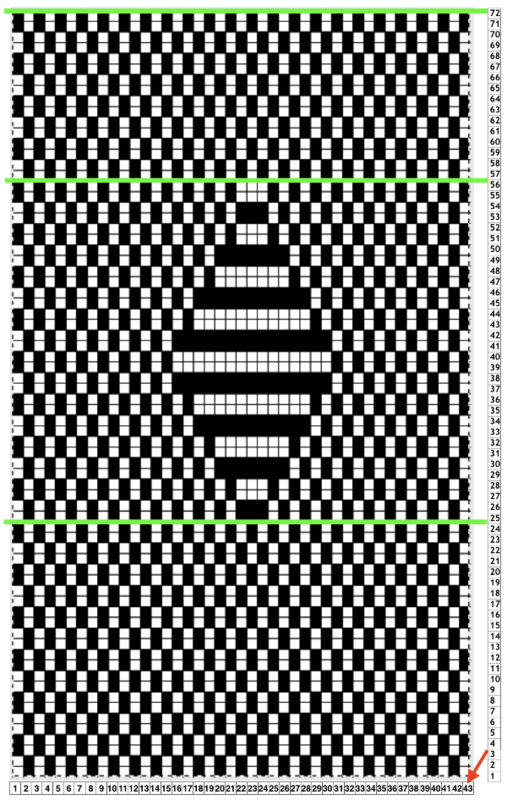 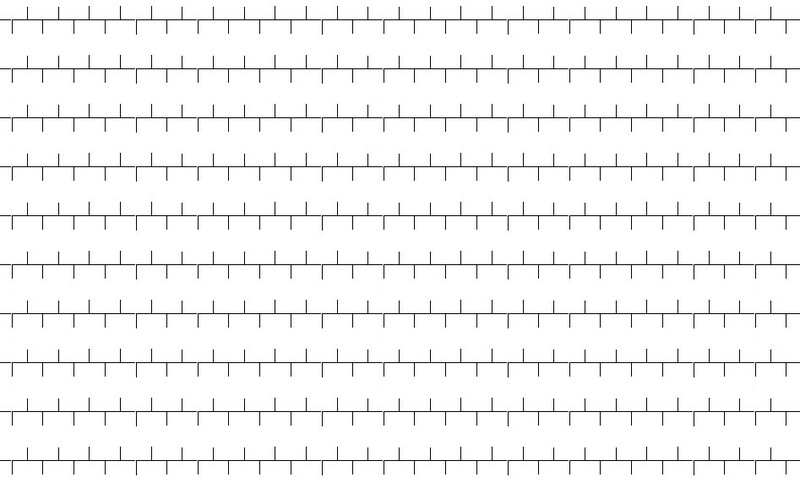 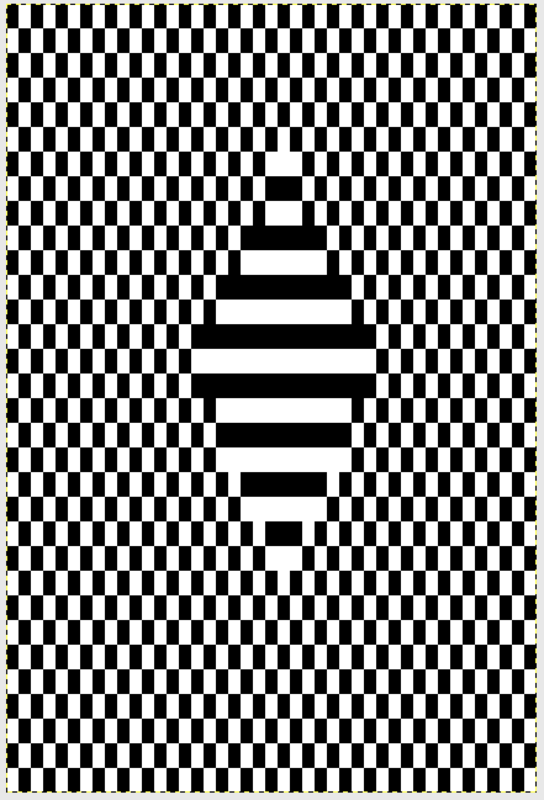 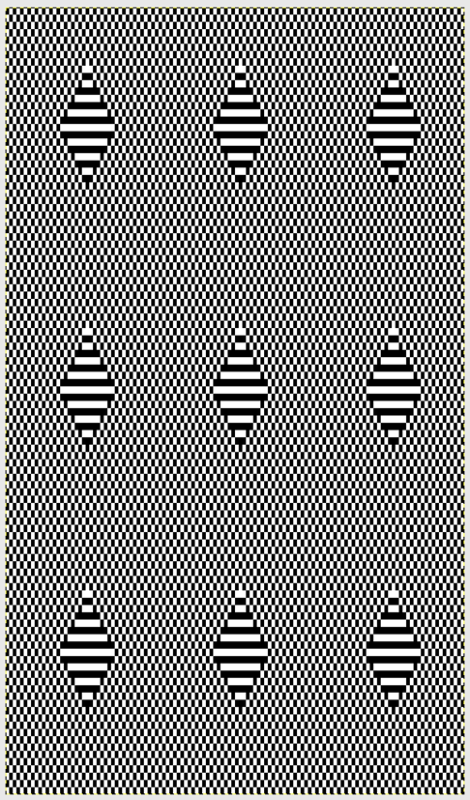 Every other needle is brought into work, and a first “zig zag” row is created, at the tightest tension possible. On the second row, the alternative needles need to be worked. 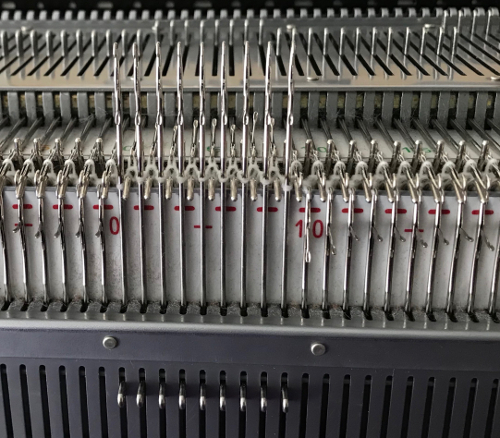 On Passap E6000 BX, LX with pushers under new needles only will help do the job. 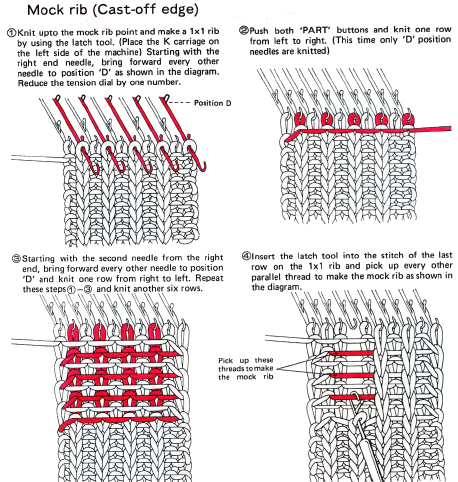 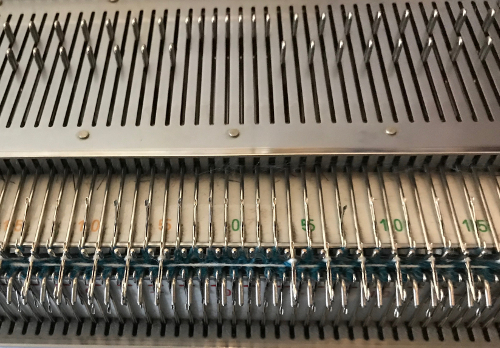 On Japanese machines: bring the new needles out to hold, set both carriages to slip. 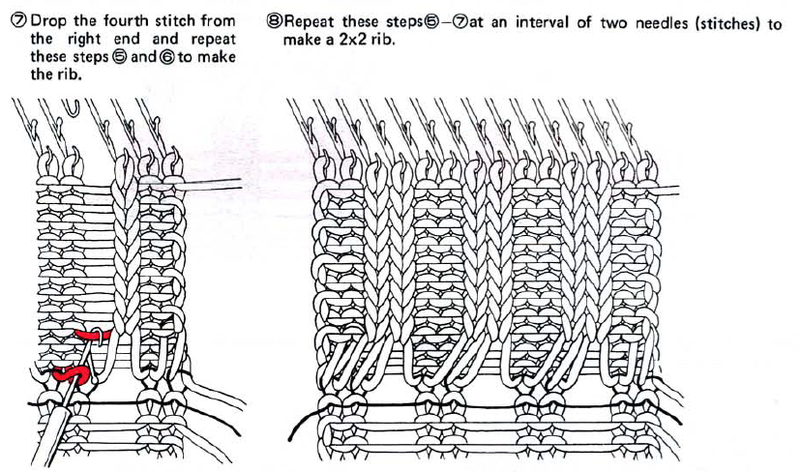 This will result in only those “new” needles knitting on the next pass. 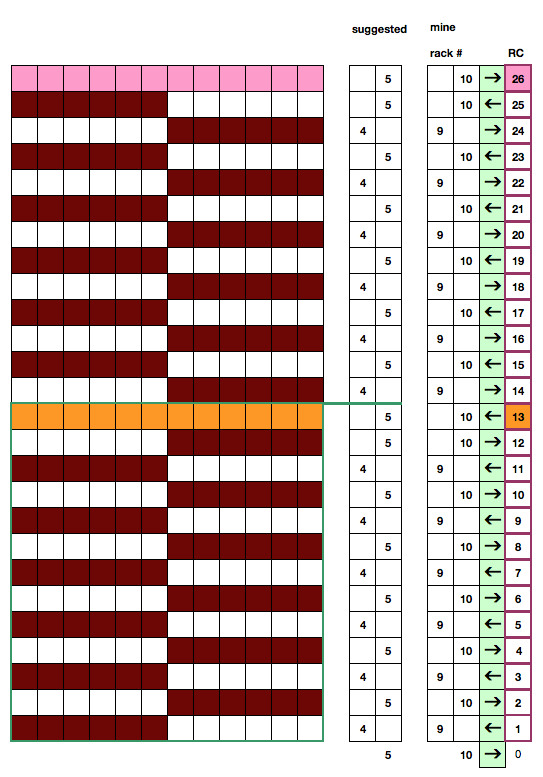 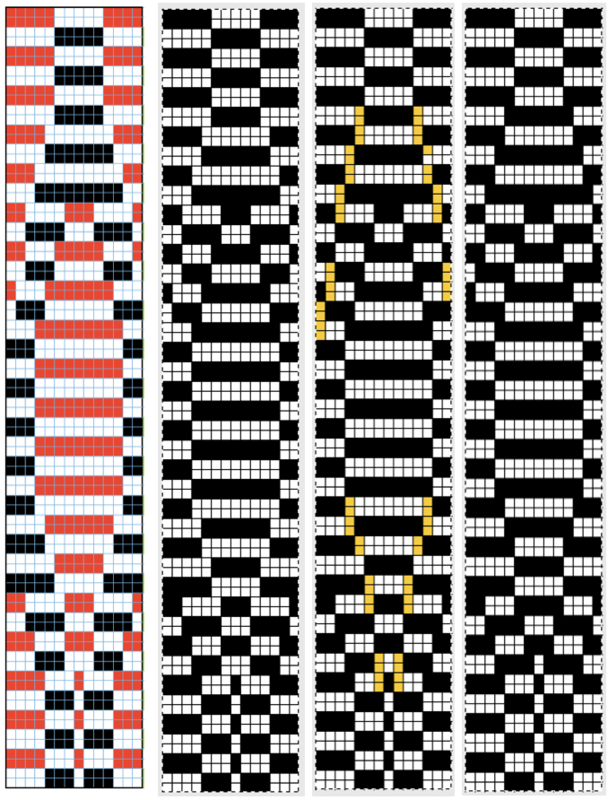 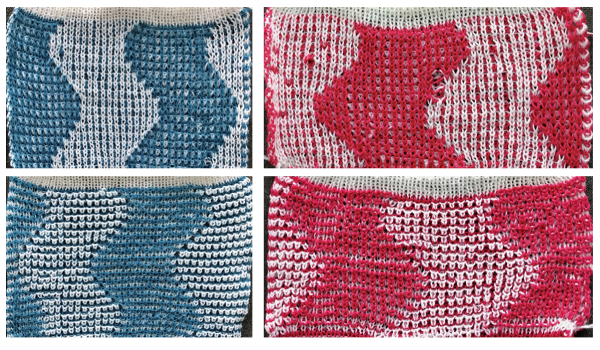 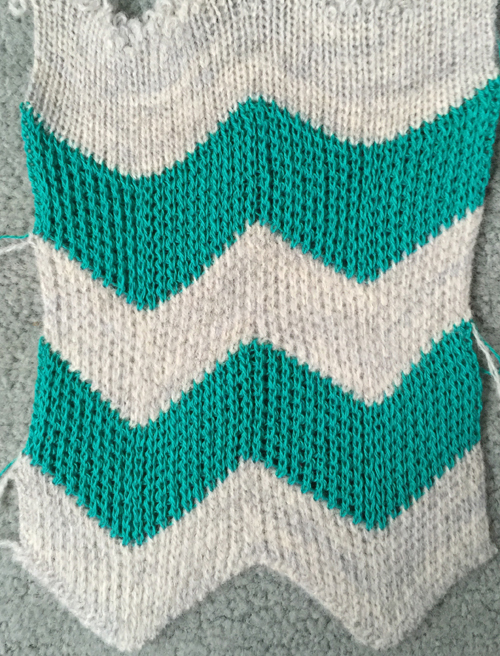 The outcome will be one zig zag crossing over the other (red over blue in photo). 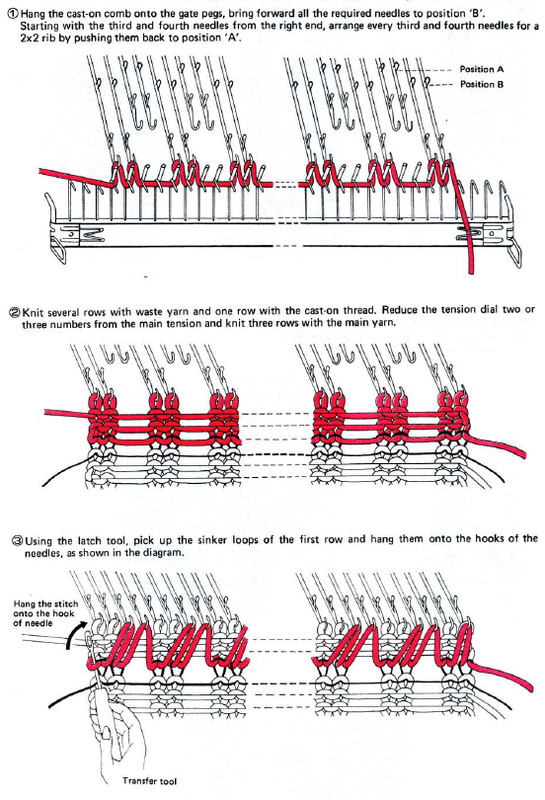 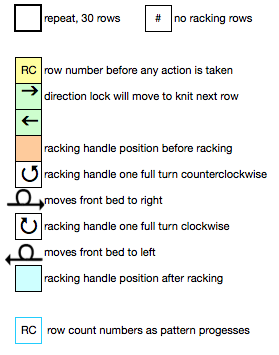 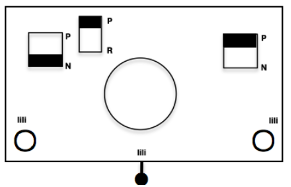 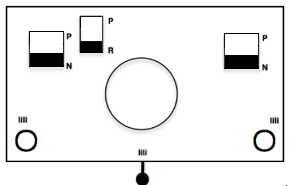 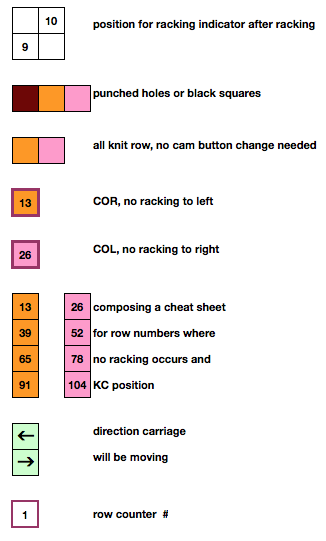 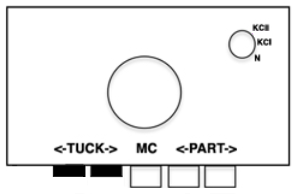 Prior to the third knit row, reset the carriages or locks for circular settings (CX/CX, opposite part buttons). 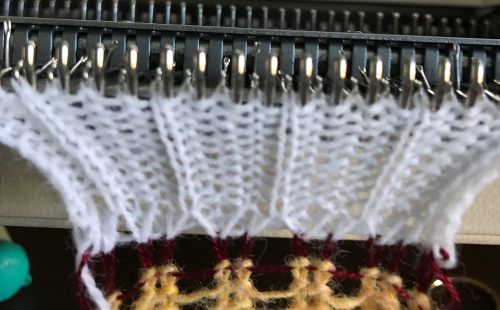 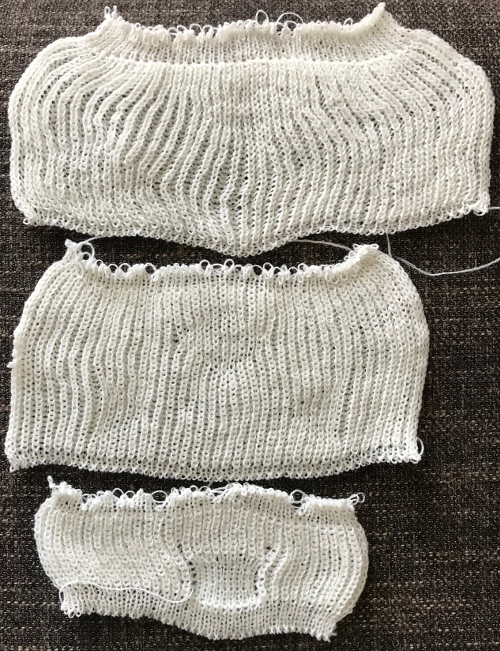 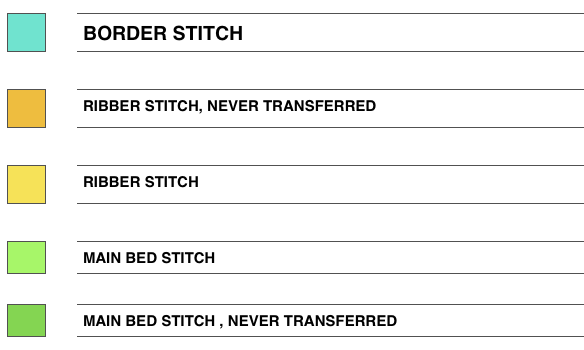 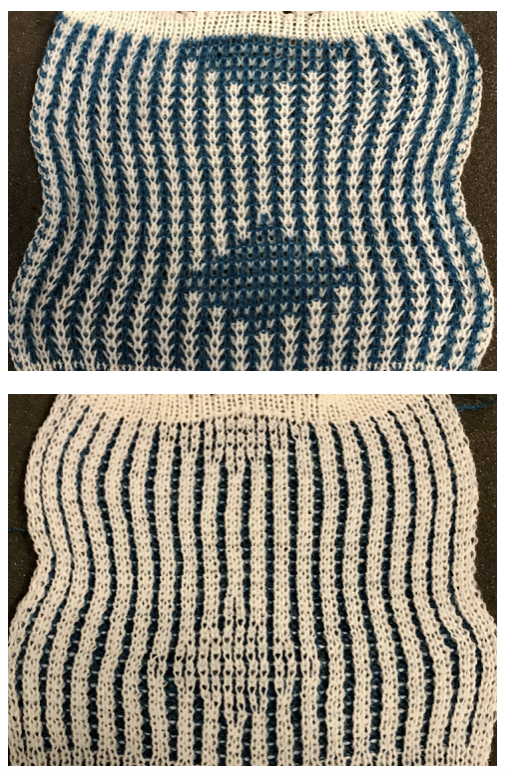 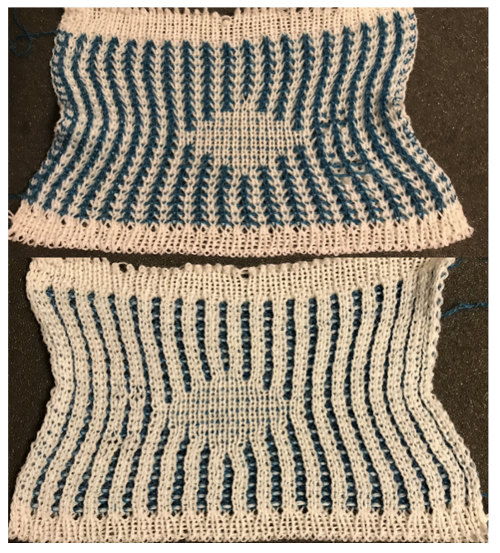 Because all stitches will be knitting on each bed, loosen the tension to about three quarters of the rib stitch size, knit two rows, change racking handle / lever and needle positions to half pitch at their completion. 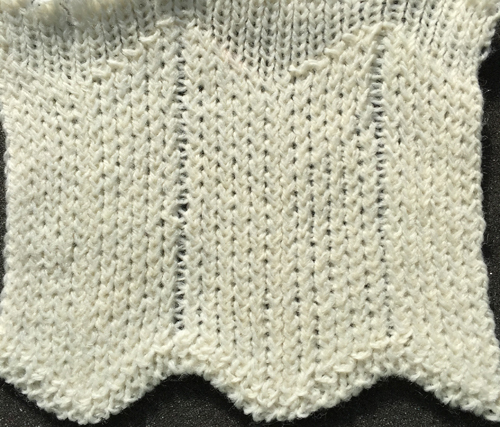 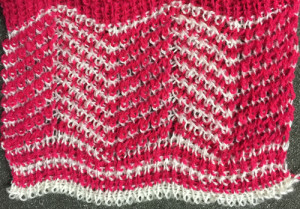 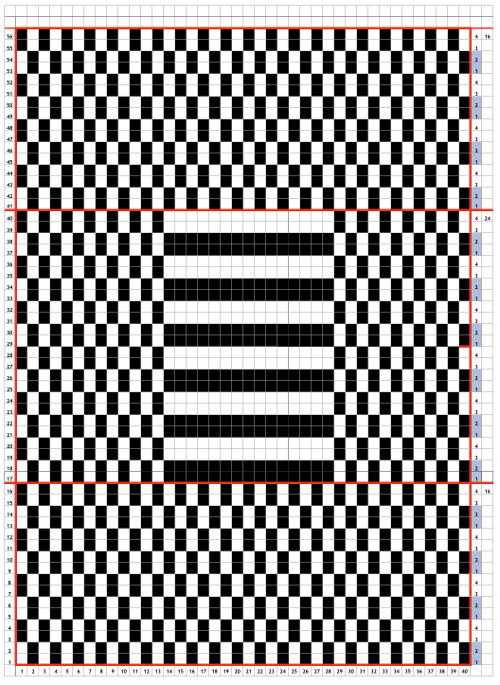 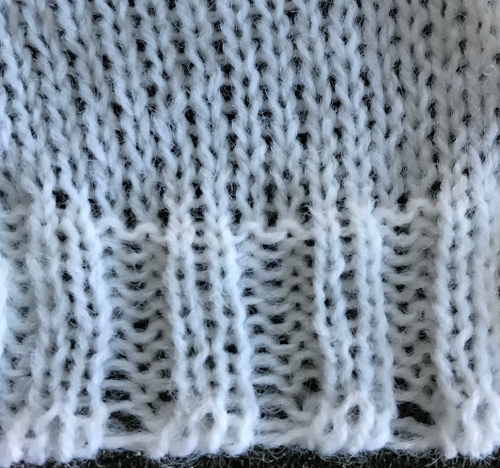 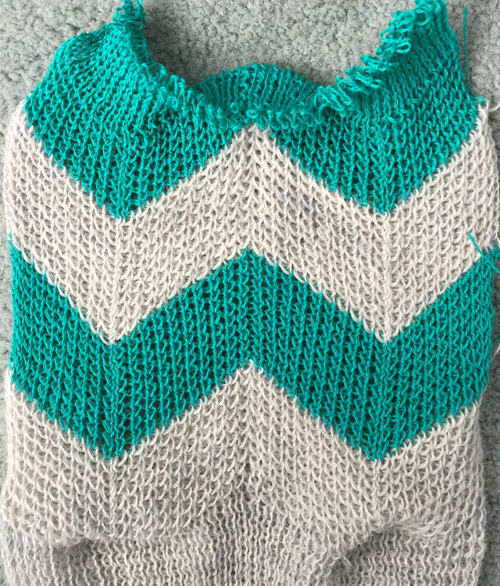 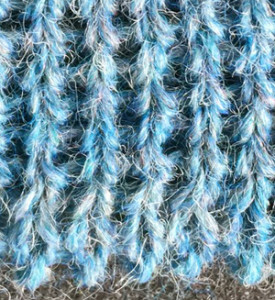 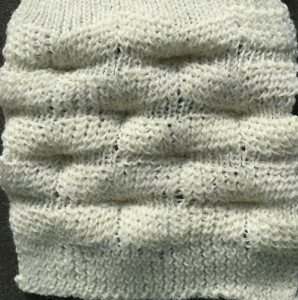 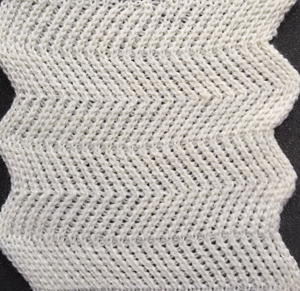 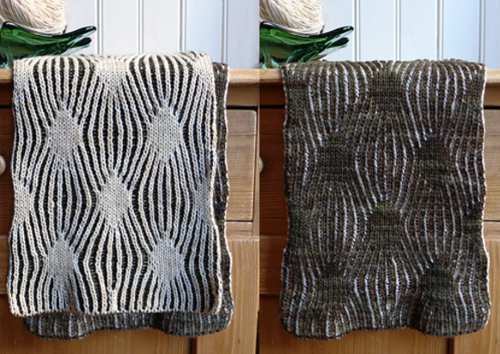 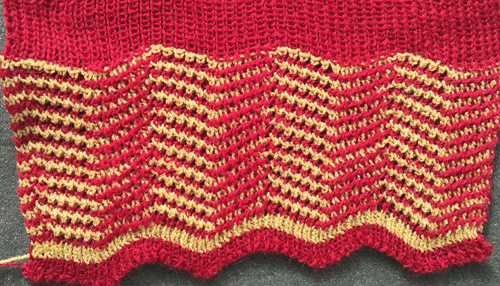 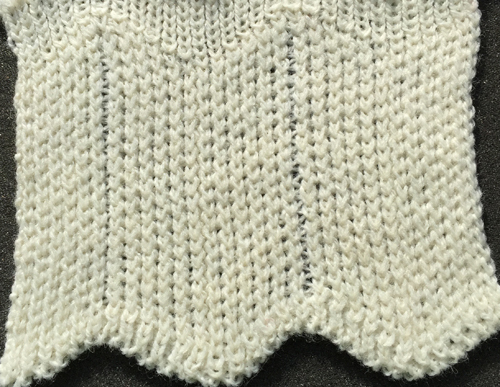 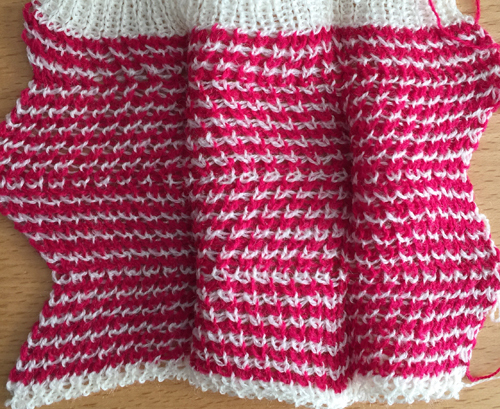 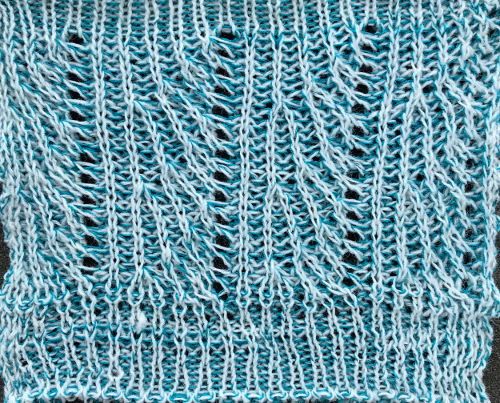 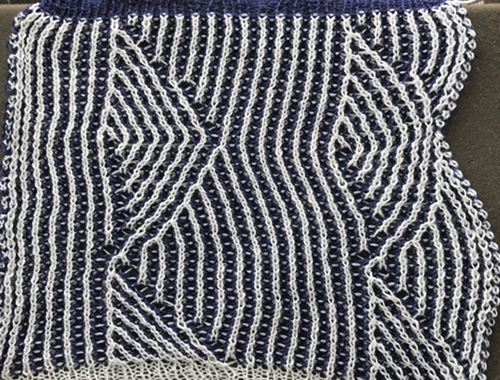 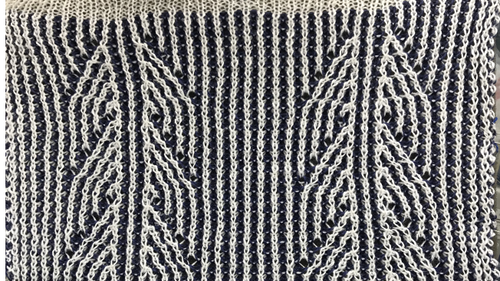 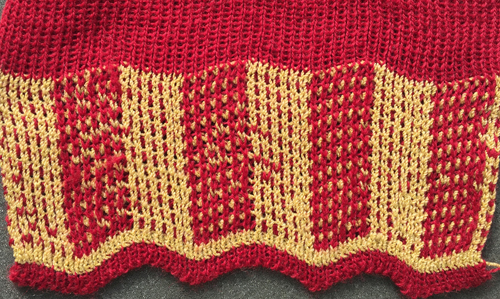 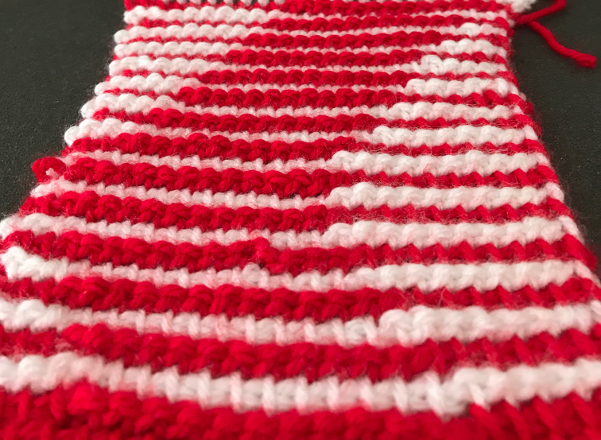 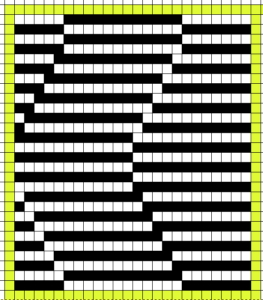 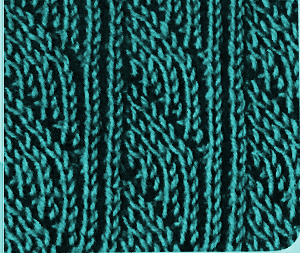 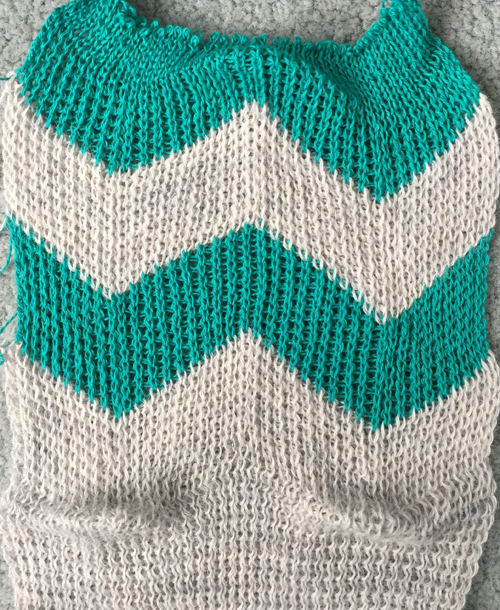 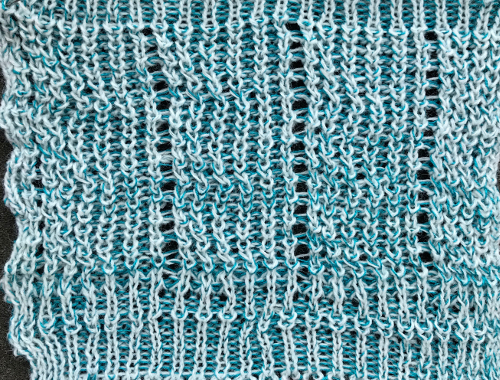 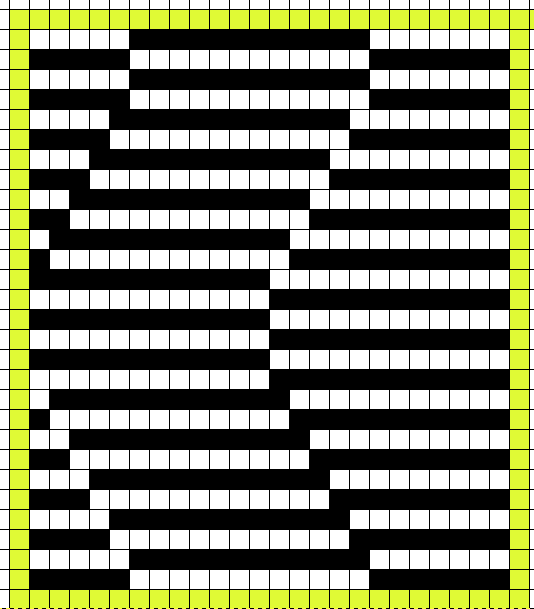 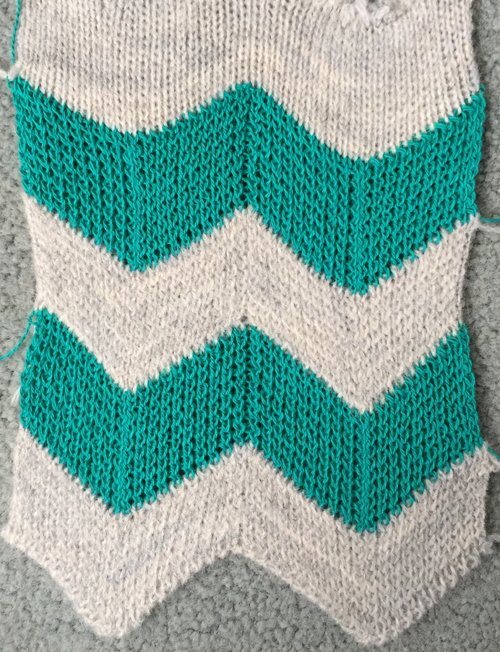 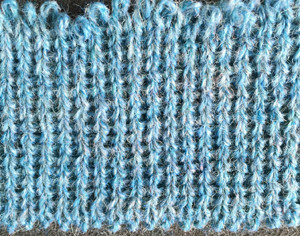 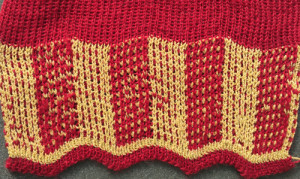 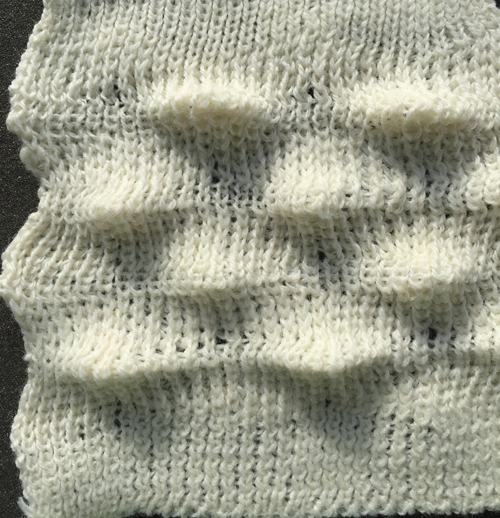 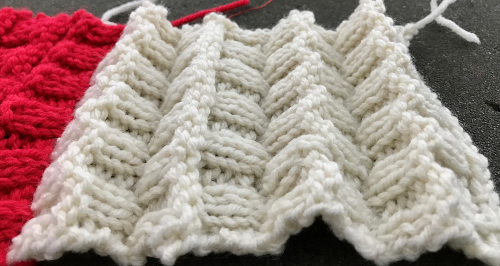 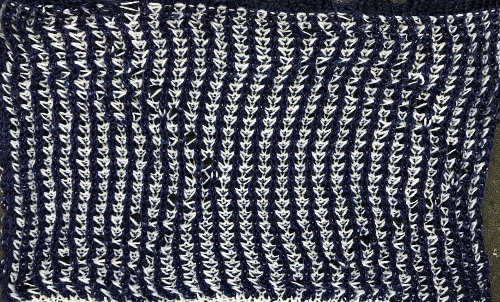 Adjust tension to desired rib stitch size, knit a closing “zig zag”, all knit row, and proceed in rib.